We are finding homes for individuals with special needs throughout Midland County, offering the opportunity to live a normal life in a real home. Read these stories to see the confidence and stability that our tenants have achieved. Keith grew up in state institutions, having been placed in one at birth. He remembers telling a friend, “Someday, I want to leave this place.” But, in his heart, he believed that it would never happen. Eventually, he was moved into a group home in Midland with five other individuals. Next, Keith spent two years living in a small apartment by himself. Neither was a good fit. Keith then began working with Reece Endeavor. Because his house was built specifically for him, Keith was able to make a number of decisions on finishes, appliances and home decor. He lives with one housemate, whom he chose, and has personal care assistants who come in as needed. Keith loves taking care of his home. He regularly tackles home repairs and landscaping projects. He also enjoys entertaining friends, eating out with friends and watching baseball and football games. Keith has a close relationship with his church and his co-workers at the hardware store where he works part-time. Recently, after major surgery, Keith spent some time recuperating at a local nursing home. On a visit back to his house to take care of a few items, he was overwhelmed by how much he missed his home. As he left to return to the nursing home, he said, “This is home; I’ll be back.” Keith is now back at his home, happy and healthy. Eric was born in December of 1959 with Down syndrome. He is non-verbal and bright – and it isn’t just his red hair and red suspenders! 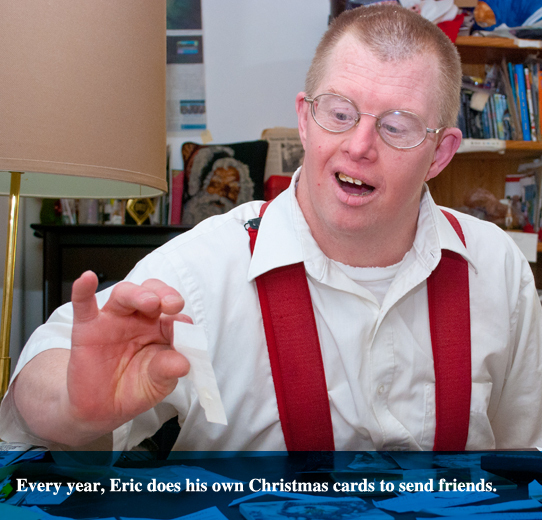 Eric is happiest when he is helping someone or creating something. He has done some nice woodcarvings, and every year he does his own Christmas cards to send to friends. In the kitchen, he reigns supreme with his chocolate chip cookies made from scratch. Yum! When Eric turned 50, he could not handle his father’s declining health and wanted his own “place”. In 2010, he moved into a Reece Endeavor duplex, which he adores. Eric is very proud of his home. A personal care assistant comes in for several hours in the afternoon when Eric returns from his job at the Arnold Center. They shop, go bowling and fix dinner together. After that, Eric is on his own. He spends weekends visiting family. Eric likes being independent. He has the opportunity to interact with his friends more, and that makes him happy. For me, Eric having his own place during the week gave me more time to devote to caring for my husband. Now that he has passed I hope to be able to visit family and friends living away from Midland. 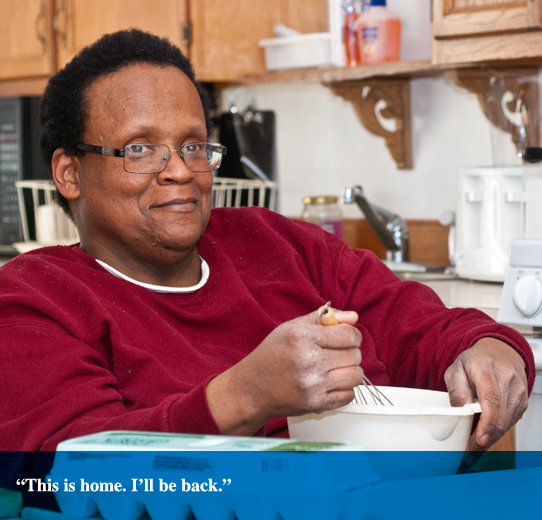 Eric now has a fuller, more complete life living on his own. It does give me a more secure feeling knowing he is happy and can have his own place, as I will not always be around. I am very grateful to Reece Endeavor. With music always playing and their dog, Snowflake, running around, it’s clear this is true. 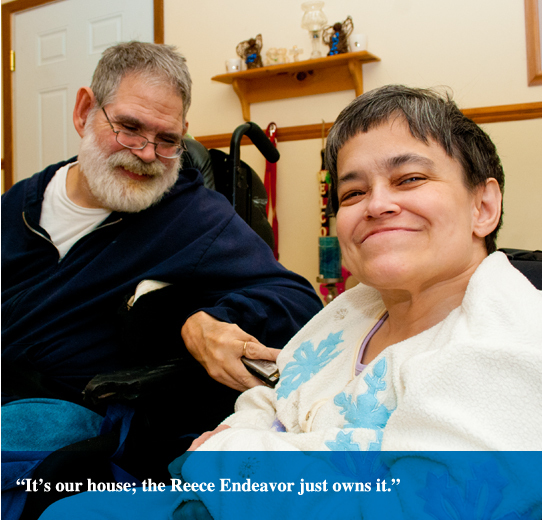 Since moving into the Reece Endeavor home, Tom and Char have become more independent, confident and spirited. They love being a part of the community and spending time with neighbors, while also having the privacy of their own home. Tom and Char moved into the Reece house shortly after getting married. Previously, they had lived in state institutions and licensed group homes. They now live by themselves and employ their own personal care assistants who come in as needed. A professional accountant handles the payroll details, while Tom and Char hand out the checks. Tom also works seasonally as a bell ringer for Salvation Army, and Char does volunteer work. Once home, they enjoy cooking, country music and baseball – and they especially love the freedom to make their own decisions.